Sometimes restoration, the story, and pinball history is more interesting and entertaining than playing and owning a title within itself. What is a “Pinball Frankenstein”? From trash to treasure, another pinball adventure story of time, patience, and hard work. My history of taking an abandoned “piece of trash” Eight Ball Deluxe and bringing it back to its former glory. Back in 2004, I purchased my original Medieval Madness (Williams, 1997) from an old operator friend in the Pacific Northwest that had bought the game as a part of four machine package he had originally planned to use for routes, but ended up sticking one in his house instead. I had finally “bit the bullet” after falsely thinking this game might go on closeout in 1998 like other Williams games of the period. It did not since Williams decided to “strike back” at operators and close out the production run, even though active orders through distributors were still pending. Typically, within 5 years after production game prices stabilized, but this particular title just continued to rise in value higher than most. While I was picking up the game, he asked me if I was interested in something else he had in storage regarding parts. As a pinball collector, you never turn down these types of opportunities. He led me to behind his house to his lawnmower shed. Opening the door I was surprised to see a partial wired Eight Ball Deluxe “Classic” (Bally-Midway, 1984) playfield sitting up against wall. He told me I could have it for free, as I had just paid $5200 for the other game, a small tidy sum during mid-2000s for a Medieval Madness. I was grateful. He stated I probably could “part it out” and make some good money of the efforts to offset the purchase. A quick inspection concluded that this playfield was much nicer than he may have thought with Day One Mylar (D1M) installed, but all I had was a flashlight for inspection (smartphones with LEDs did not exist yet). I tried not to hide a smile, but he knew that it was going to a good home. I took the playfield home, and did a better a better inspection of the playfield top and bottom in my workshop under hard light. I discovered the only thing missing was a couple of light boards and part of the wire harness was cut and missing. The top of the playfield had very little wear. However, the plastics had yellowed due to UV light exposure. After final evaluation, I recognized that this playfield was much too nice to disassemble and sell for parts. Keep in mind, during this period reproduction of Eight Ball Deluxe parts had just been started. Most were not available. Much of the assemblies could have gone for very good money on places on Ebay, if I had decided to be a “pinball scrapper”, which I dislike intensely if a game is salvageable. I decided instead, I was going to build another Eight Ball Deluxe with this playfield. However, there were a few problems with this decision. I did not have a proper lower cabinet. I did not have a proper backbox. I did not have a correct backglass. I did not have transformer, upper wiring harness, or most of the internals. I did have an extra set of displays from a Stern Lightning, and board set from a Bally Vector. So, the parts sourcing and true adventure began. The cabinet (EBDC #1088) came out of another collector’s barn, another 1984 version, but the decals on this cabinet (the 1984 version was not stenciled) had been nuclear blasted black and white from UV light. The backbox (EBDC #321) came from a roached out game on Ebay, but was in better condition than the lower cabinet. The backglass (EBDC #888) came from another friend. The transformer and part of the internals came from a Paragon (Bally, 1979). 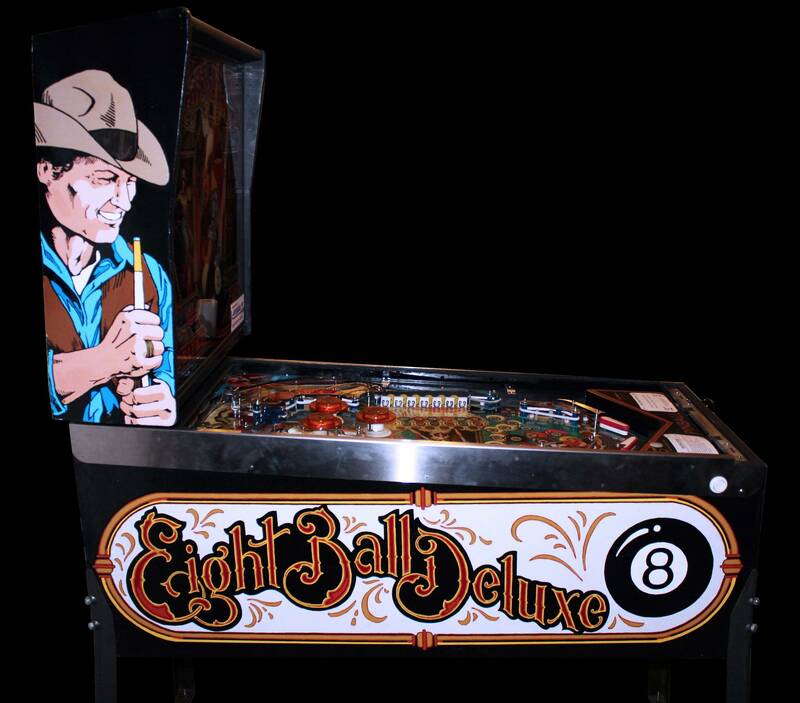 The wire harness came from another Eight Ball Deluxe (the 1981 version). This all took about 6 months to acquire the parts. Then I started the REAL work. People may have heard the modern catchphrase, “Building a pinball machine is hard”, but some do not realize it can be even harder when you do not have the parts, or recognize differences between even the same game titles. Information across board was spotty at best across all sources of information at that time. 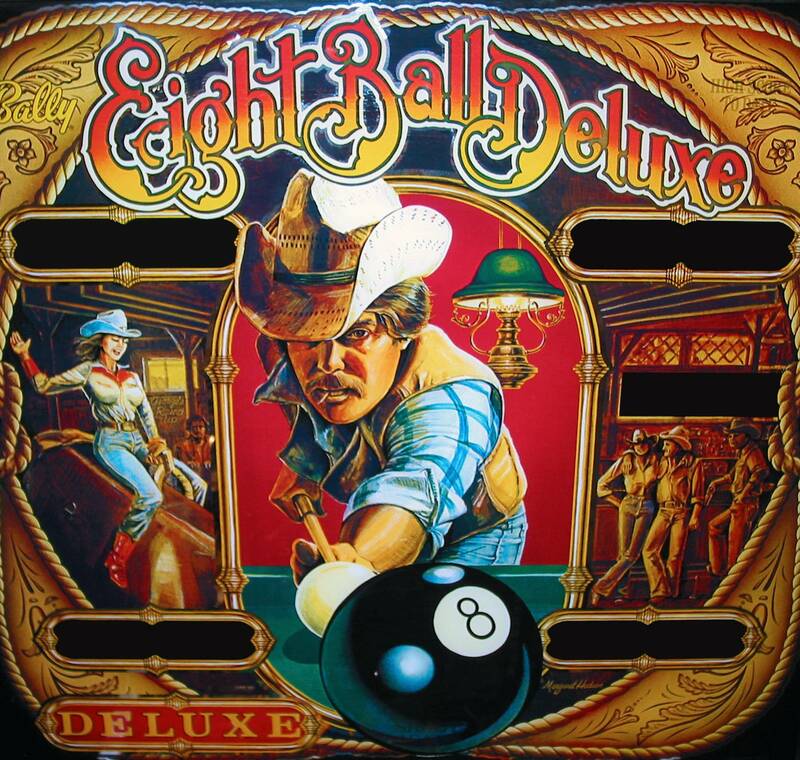 Eight Ball Deluxe “Classic” (Bally-Midway, 1984) does not use the same wire harness color coding as Eight Ball Deluxe (Bally, 1981) or Eight Ball Deluxe “Limited Edition” (Bally, 1982). The manuals were inaccurate at the factory, and even mistakes were made based on construction of the wire harnesses. As a result, when I built the game, everything had to be constantly checked between multiple versions of wire schematics to make sure for example, I was not hooking up GI wiring per say to the switch matrix or lamps, and blowing up boards. I also had to convert the Stern displays so they could be used with the Bally games, and repair all the boards as well, particularly the rectifier board. Remember, Alltek boards were not yet fully available, and neither were things like XPin displays! A total of SEVEN different games were used to build out the game. I finally finished the game, and it worked after nearly 1000 hours of overhaul. After completing all the diagnostics, wiring, and gameplay corrections, it was time to finish the cosmetic corrections on the playfield and cabinet. However, I was so exhausted I decided to take a serious break. 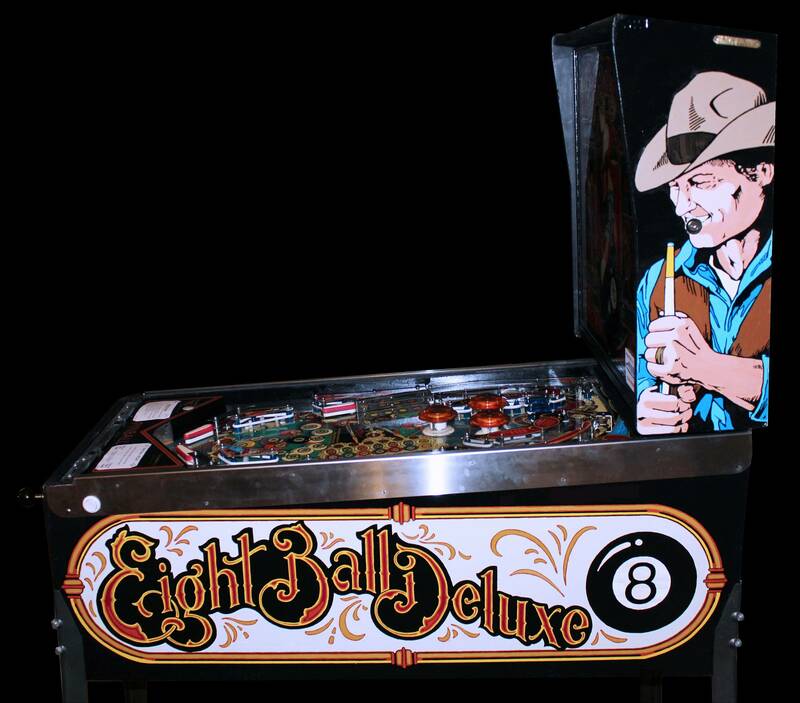 Instead this game became immortalized, when it was taken to the FIRST Northwest Pinball and Arcade Show in 2005, and had the living tar played out of it in a tiny little pizza parlor in Oak Harbor, WA (without air conditioning and insufficient power) long before its days of today’s events at either the Seattle Center or Tacoma Dome. It was a very close reference comparison to the Vancouver, BC ‘Flipout’ starting vestiges today. After all this work, I actually ended up SELLING the game to a fellow collector who was just amazed at the efforts. Although I was sad to see it go, I know someone would appreciate it more than I.
I did not think much about it, as I moved onto my life. Fast forward to 2015, 10 years later. An Eight Ball Deluxe comes up on the local Portland Craigslist. I look at the photos. It is the same collector! He told me he had travelled back and forth with the game and it had been to nearly every single pinball show in the Pacific Northwest for over a decade. I bought the game back again, purely out of nostalgia. I re-restored the game AGAIN (if this is even a word? ), but this time, I fully finished the project. Full color shaded cabinet repaint (11 color backbox and 7 color lower cabinet) beyond factory specifications. NOS plastic set, pop bumpers, targets, playfield glass, and displays. 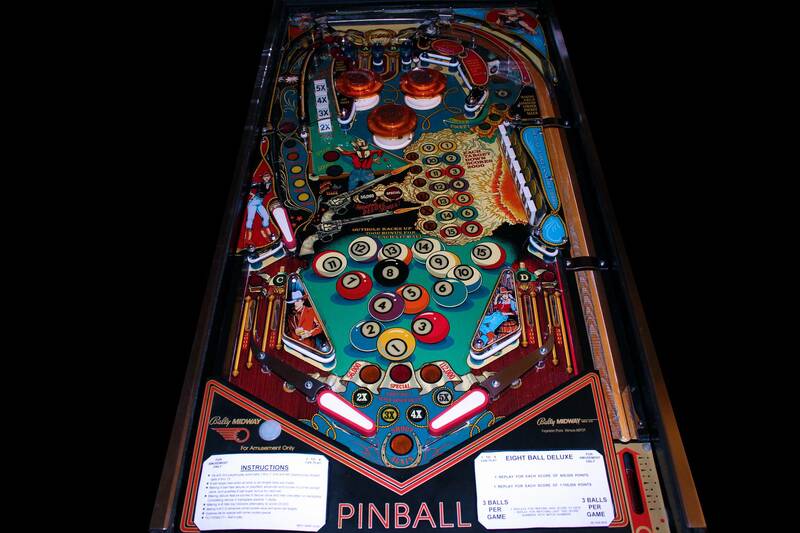 The playfield remained in superb condition even with the aging of machine and playfield colors due to the Day 1 Mylar and care of the former collector. The game found its way back to “The Stronghold”, its true home, where it was meant to stay. The game is now nearly 34 years old and still counting, playing as close as it can to being new even though it has well over 150+ thousand plays. xTheBlackKnightx edited this story on October 27, 2017. Great story Jim....would have been tough for me to let it go after sinking 1000+ hours into on the original pass. Glad you were able to get it back and fully restore the cab. The cab looks fantastic! The whole aspect of "chroming" parts is an example of aftermarket modification costs, not "high end" restoration. A "high end" restoration should include areas such as re stencilling or replacing side art on cabinets. This game was a full restoration. Thanks for sharing your wonderful story. Treasure your 8-ball! Jim Rohn was a wise American entrepeneur and business man, I am just familiar with his life experiences, advice, and quotes. I am not dead, yet, therefore I am not Jim. I am "The Black Knight", a long time pinball collector, restorer, and historian. You can find my reference work on other online sources teaching others as a mentor. Do not ever let that machine out of your site again. It is as much a part of you as your own flesh. Amazing story and truly amazing dedication to bring this machine back into glory. Great story - I too dislike "pinball scrappers" - too many salvageable games have been parted out over the years. Love this pin so much and love the story. Awesome to heard "pin love" stories like this. Congratulations ! This should be a movie! Haha good story jim. Would love to learn though.